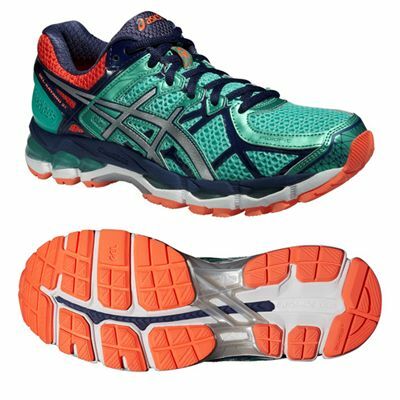 A top choice for overpronators, the Asics Gel-Kayano 21 ladies’ running shoes offer great stability and comfort and weigh 305g (10.8oz). The FluidFit™ upper ensures an excellent fit thanks to its 4-way stretch mesh, and the Exoskeletal Clutch Counter and California Slip Lasting deliver great stability, comfort and support. The high-quality midsole boasts gender-specific cushioning and a range of the latest, most advanced systems that provide top levels of support, cushioning, stability and durability as well as more natural running motion and increased gait efficiency. The ComforDry™ sock-liner is removable and anti-microbial and the outsole uses abrasion-resistant AHAR sponge and blown AHAR+ material for better comfort, durability and ride. The Guidance Line® improves gait efficiency and the 3mm higher outsole reduces tension in your Achilles. for submitting product review about Asics Gel-Kayano 21 Ladies Running Shoes.